Small, but noticeable ways to improve your home. We started off our pool house remodel with a half bath between the house entrance and the bar space. It had a narrow swinging door that forced snugging against the vanity just to close it. 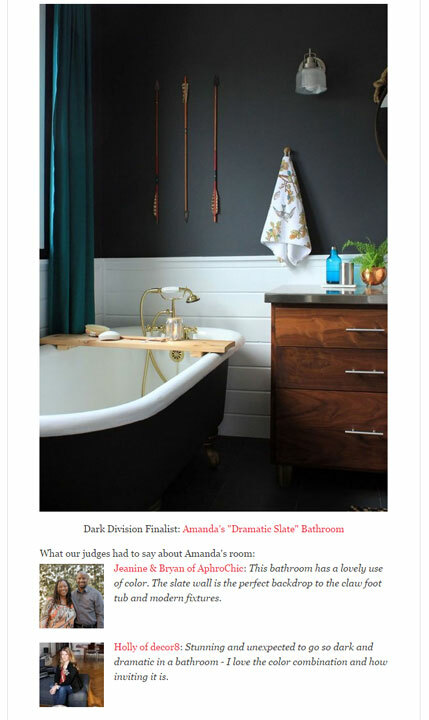 The bathroom itself was dark, in part because of dark wood clad walls, but also from a lack of natural light. Our remodel plans included adding wider doors to the bathroom as well as the house. A six-foot wide sliding glass door now connects the house and this space. When I proposed using the previous swinging glass door for the bathroom, Ben gave me a funny look. I continued with my rationalization that I’d like a way to get natural light into the small space, and the glass door, with the addition of frosted film, was perfect. This gave us a wider opening, and with a pocket door, a more user-friendly function. Adding a pocket door in a 2 by 6 framed wall is easier, and sturdier, than in a 2 by 4 wall. Placing 2 by 4 boards flat on either side of the pocket area, with the track installed, makes a rigid wall. Ben installed trim around the door frame to finish it off, with little brackets at the bottom to keep the door in line. I ordered a round locking pocket door handle to fill the hole from the previous knob. Obviously, a clear glass door doesn’t give privacy for a bathroom. We called a local glass company and asked for pricing on frosting a tempered glass door. I don’t remember the price, but it was really reasonable. However, they said there’s a 50/50 chance the process of frosting the tempered glass would shatter it. We decided to play it safe and chose a frosted window film instead, applying it to the bathroom side of the door. It obscures really well, unless someone is standing within inches from the door, but still lets light flood in. With the door in place, we turned our attention to building the vanity. My plan included a floating slatted shelf with a wooden band across the top. When building something, Ben always plans for MWS: most weight scenario. To support the front of the shelf enough for a kid, or grown man, to stand on, Ben ran a steel pipe across the front of the shelf, drilling through the baseboard and wall for it to rest on the wood. A cut piece of baseboard serves as a rest/support along the back. Constructing the shelf was a pretty simple process. A 2 1/2 inch thick face, a 1 inch wide strip (to cover the top of the pipe), 2 inch wide slats, and a 3/4 inch thick strips for the back. We started at the center and used a 1 1/2 inch spacer to keep the width even. A dry fit run to make sure it fits before adding the final two strips along the sides. Another cut piece of baseboard follows the top of the shelf, creating a nook for the shelf to rest in. It also keeps the shelf removable for painting. To support the vanity top, a wooden frame lines the walls, with a four-inch board along the front. With the walnut sanded, attached, and oiled, it’s a thing of beauty. Keeping this space clear of unnecessary junk is important, and cabinets tend to become a catch-all for lotions and potions. A single shelf allows room for a basket of toilet paper and a first aid bin. Clearly, it didn’t take me long to test things out. Seeing the vanity peeking out has me excited to get the marble top in place and install the rest of the batten strips. I’m still caulking away my spare time, but adding these finished elements is really making the end of this gigantic process seem within reach now. There is light at the end of the tunnel. Exactly six years ago, also on a Friday the 13th, we officially became owners of this place we call home. Throughout that entire time, we’ve updated the house, room by room, step by step. Six years in, we’re nearing the end of our single biggest and last(!?!) space, the pool house. After slowly rebuilding the bones, we’re getting to the point where fun finishing elements are going in. One area that saw action this weekend is the kitchen, that started off life as a closed off three step raised wet bar. When Ben builds something, he builds it to withstand the weight of a large quadruped. These shelves are no different, with a frame work of welded steel brackets, secured into the studs. A 48 inch wide vent hood provides ample ventilation. With a custom cover, it’s large and in charge, anchoring the wall. Over the weekend, we built the walnut shelves and all of a sudden, things are taking shape. Between the steel bracket, Ben added 3/4 inch thick strips of wood to serve as a spacer. Then a piece of walnut plywood covers the top and the bottom, with recessed lights tucked in the bottom panels. Solid walnut strips cut to 2 inches wide finish out the front and side faces. A thin strip will cover the bottom of the vent hood cover, then I’ll fill, sand, and seal it all before we add the remaining batten strips. It’ll be a happy break from caulking for my fingers. The shelves follow the angle of the outside wall, tucking in so perfectly. I spent a couple of hours scrubbing and cleaning the 48 inch DCS range we found on Craigslist for only $1500. The toe kick cover is waiting off to the side until I clean it up. Under shelf lights are a special touch that glow at night. If you want to fully appreciate the progress, take a look back at these highlights. It’s what I do when I feel like this process is dragging on. Nearly six years ago, when we purchased this house, the pool house was rocking a lot of dated finishes, including dark stained and streaked wooden lap siding. To achieve the light, airy feel we’re after, our plan includes painting the walls white. While we could have used lap siding and painted it white, I feel it would have looked too much like an exterior in an interior space. After many discussions to make my board and batten dreams come true, Ben agreed to the wall treatment. Before installing the tile floors, we started installing the upper portions. Now, with the floors and baseboard installed, we’re working our way around the room installing the remaining batten strips. Attaching the strips is the quick, easy part. Caulking is the very necessary, but far more tedious part of the equation. Applying and smoothing the caulk takes a toll on the fingers, literally making the tips bleed after a while. In an attempt to avoid bloody fingers, I picked up a Caulk Buddy for three bucks from Ace Hardware. I had high hopes for it, but when put to use, the rigid yellow plastic doesn’t allow the flexible white end to flex into the joint enough. Back to bloody fingers for me. But I accidentally realized the bandage on my finger provided just enough of a barrier between my finger and the wall. Unlike some of the tools available, I can easily control the pressure applied and the amount removed. Along the three benches, the batten strips terminate directly into the bench. To fill the small gap between the strip and bench top, without making a mess of the stained wood, I tape off around each batten. Then remove the tape immediately after, before the caulk dries and peels away. Now, if you’ll excuse me, I’m heading back out to continue on my miles long quest to caulk the batten seams. Enjoy your weekend! Last week, I shared our process of building the tree storage benches in the pool house, with one last lid to build. Bright and early Saturday morning, Ben built the last top. He followed up by using a router to cut the recessed ‘handles’ in the top front board. To do so, he screwed a pair of boards along the top, giving a straight edge for the router to run along. It takes multiple passes to get a smooth finish, leaving piles of shavings and dust behind. The handles are a subtle detail, allowing us to open the lids without protruding hardware. I followed up by spending several hours sanding everything smooth with 220 grit sandpaper. Wanting a deep, rich, walnut like finish for the pine, I knew I’d need to stain the benches. Although technically an indoor space, the potential splashes and humidity from the pool mean these benches need a durable finish. Either with an indoor stain and oil/poly top coat, or an exterior stain/waterproofing combo. Exterior stains come in a variety of colors and transparencies: clear, transparent/toner, semitransparent, semi solid, and solid coverage. For this application, I wanted to see plenty of the wood grain, but deepen the color. When we stained our decks, I did oodles of searching for the Goldilocks in the stain world. Deep brown without a red or orange undertone, transparent, under $60 per gallon, and water-resistant. After hours of online and in store searching, I found the perfect solution: Olympic Maximum Stain and Sealant in Canyon Brown. We used the same stain on the large structural beams running the length of the pool house, so I knew exactly how it would look. Before staining, I vacuumed the benches, wiped off any dust left, then masked off the inside and the floor. With gloved donned, I started with the underside of the lids, applying the stain with a brush to get in the deep details. For the smoother outside faces, I applied the stain with a brush for the grooves, and an old t-shirt scrap for the board faces. We’ll paint the entire interior of the benches to keep it all looking nice and clean. The darker hinges aren’t nearly as noticeable against the dark wood, exactly as I hoped. Now that the baseboard and benches are in place, we can attach the lower portion of batten strips. I’ll follow that up with miles of caulking and then we can paint it all white. Eeeek, I’m so excited to for the day we’re done painting. More tile in the pool house!! We really know how to have fun. When the pool was initially built, everything immediately surrounding the pool had tile. As the new structure settled, some of the tile cracked, a ladder on the deep end was removed, and outdoor grade carpet covered everything. Only the bathroom hadn’t been tiled and was a quarter of an inch lower than the rest of the floor. Ben laid sheets of 1/4 inch Hardie backer to even it out, then carried the tile into the room. From there, the tile continues into the home of the future kitchen, going under the cabinet locations. Unfortunately, the white ’tile’ edge is molded into upper fiberglass portion forming the pool walls. Without completely reforming the pool, it has to stay. Womp, womp, woooomp. From this angle, it looks like we’re finished with our tiling adventure, but we still have about half left. All of the angled cuts took longer than the previous section, but it’s really taking shape. With the end of the project drawing nearer each weekend, I’m slowly stockpiling accessories as I find something I like. Due to the nature of the room, accessories will be limited, so I’d like for each one to be both fun and functional with maximum impact. Do you have any favorite outdoor accessories? Or pool/beach essentials?